Popcorn is one snack I've had ready access to all month, because we bought a gallon jug of locally grown popping corn at the Intervale "eat local" kickoff party in late July. I'm glad we did: it cooks quickly, so if you arrive home ravenous, hunger can be staved off long enough to come up with a game plan for cooking an actual meal. Even though we've had it every two or three days, the container is still two-thirds full! Gahlord and I tried this localvore version of dessert popcorn a few nights ago, inspired by my friend Mandy's tales of homemade junk food. It's easy to make, and really good! It pays to be a bit careful not to overcook the caramel, but other than that, you really can't go wrong. Put the honey and 2 T butter in a saucepan on the stove, over high heat. You may want to add a little bit of salt at this point (under 1/4 teaspoon? ), especially if you're using unsalted butter. Make sure your saucepan holds at least 5 or 6 cups, since the honey will bubble up quite a bit. Meanwhile, pop the popcorn, and dump it into a big bowl. We have a stovetop popper, and it usually takes about 4 to 5 minutes to cook one batch. If your popping method will take longer, either put the honey mixture on lower heat, or wait until the popcorn's done to cook the caramel. Popcorn in the bowl? All righty. 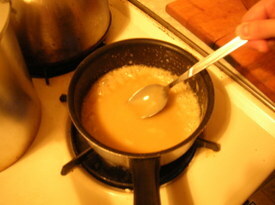 Now, keep stirring the boiling, bubbling honey-butter caramel until it seems thick enough — about 3-4 minutes. I dipped a chilled spoon into it and when it was thick enough to coat the back, I considered it done. Remember, it will harden once it cools. 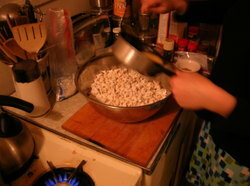 Working quickly, drizzle the caramel over the popped popcorn, scraping out the pan. Toss the popcorn-caramel mixture with two spoons or your hands, until all of the popcorn is evenly covered with caramel. This stuff is pretty great, but I think the one improvement I would make using non-local ingredients would be to add toasted peanuts, almonds and pecans. And maybe a wee plastic prize. Enjoy! Any leftovers can be pressed into snowball-sized popcorn balls and wrapped in wax paper for later. This is fun to make. There's a lot of time between certain steps, but if you're doing other things in the kitchen and you don't want ice cream right now, it's a great side project. Put the beans in a heavy saucepan with a lid, and cover with the boiling water. Let sit, lidded, for an hour or so, then stir in 1/4 cup of the honey. Simmer over medium-low heat for another hour, adding water if necessary, then turn up the heat and stir the mixture continually until almost all the water evaporates and you have black beans in a dark, heavy syrup. At this point, the beans will hopefully be tender. Pour into a medium-sized bowl and allow to cool. Scald the milk in the top of a double boiler. Beat the egg yolks slightly in a small bowl, add the salt and just under 1/4 cup of honey, then beat again. Spoon some of the hot milk into the eggs, stirring, then add the entire egg mixture to the milk, and stir again. 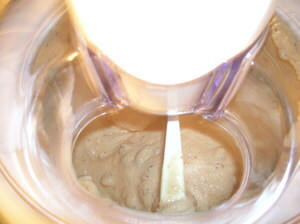 Continue to stir constantly over gentle heat in the top of the double boiler, until the custard begins to thicken. As soon as it is noticably thicker than water and can coat the back of a spoon, remove from heat. Add the custard to the bean-syrup concoction, and taste it. If necessary, add a pinch more salt and some more honey. You'll be diluting the mixture with cream in a minute, but the honey will mix more evenly with warm ingredients, so it's important to adjust the seasonings now. Keep in mind that things taste less sweet when they're frozen. Stir in the heavy cream, cover the bowl, and put it in the fridge for 4 hours or overnight. One hour before you'll put the mixture in your ice-cream maker, put it in the freezer, checking and stirring once every 15 minutes. Then, make ice cream! Our ice-cream maker is basically a special insulated bucket that stays cold in the freezer, and you affix a plug-in part at the top that attaches to a revolving paddle. 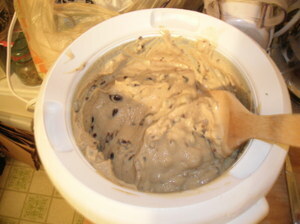 I turned on the machine, dumped in the mixture gradually, and the ice cream was done within about 25 minutes. It was still a little soft, so I packed it into a yogurt container and froze it overnight until it got hard as a rock. Way back in the first step, I scorched the black-bean-and-honey mixture and just rinsed the beans off and continued. I'm sure it affected the taste a bit, but I didn't mind, because to me the end result tasted coffee-flavored. There's no accounting for taste, though: more than one person at Monday's dessert potluck said the black beans reminded them of chocolate chips. 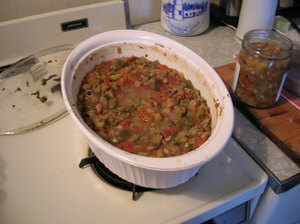 If I made this again, I'd be more careful not to burn the beans, and I'd use a bit less honey. Outside of the Eat Local Challenge, I might use softer and naturally sweeter Japanese red adzuki beans instead of black ones (canned beans would save having to cook the beans). Provençal ragout avec aubergines! I made this vegetarian/vegan-friendly casserole last night when I realized we had all the right local vegetables in our fridge. The quantities of individual veggies could be changed quite a bit, and I think it would still be OK.
Place the beans in a covered, ovenproof dish, cover them with twice as much boiling water as there are beans. Keep in mind that they'll double in size, so be conservative with the quantity of beanage. Let them sit about an hour, then drain them, reserving the soaking liquid. Set the oven to a really low temperature, about 100 to 150 degrees Fahrenheit, or "warm" on most dials. Chop up all of the vegetables into chunks no bigger than the first joint of your thumb, smaller if you'd like them bean-sized. Mince the garlic and herbs. As you finish cutting up each ingredient, put it in the casserole as one layer, and sprinkle it lightly with salt and pepper. Drizzle the whole thing with as much olive oil as you think you'd like — I used about 1/4 as much olive oil as there were beans. Ladle enough bean-soaking juice into the dish to cover the bean layer at the bottom. (I poked down with a spoon to see where the liquid was, but I suppose you could also just add the liquid first, before the veggies go in.) Cover the dish and set it in the oven for several hours. I left this overnight for about 7 hours in a very low oven, but if you're not comfy going to bed with the oven on, you could also cook it this way during the day. If I were doing daytime cooking, I might boost the oven temp to 250 or 300 degrees to shave off two or three hours. Serve over bread or pasta, or just eat it plain, as a hot or cold stew. This recipe is easy to double, triple or quadruple. I think you could make enough to feed a sizeable commune, if you had enough baking sheets and time. Preheat oven to 300 degrees Fahrenheit. Put the maple syrup in a saucepan and put the butter in the maple syrup. Melt butter and syrup together over gentle heat until the butter disappears. 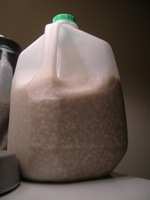 Pour this mixture over the oats in a bowl, and stir until the oats are coated with it. Cover a baking sheet or two with the proto-granola; the thinner you spread it, the more quickly it will be done. Put the pans in the oven, and stir with a spatula every 7 to 10 minutes, or more often if you think it might be toasting quickly. This amount should take about half an hour, maybe a bit less. Don't let it burn! Some handy tips: Remove granola to a metal bowl immedately after taking it out of the oven. (It's easier to get off of the pans when it's piping hot.) Soak pans in hot water before trying to clean the candified maple syrup off of them. I imagine this stuff would be marvelous on top of vanilla or maple ice cream. UPDATE: Allaire just told me it's actually 1/4 c. of butter (half a stick, not half a cup). I've corrected the ingredients list above, but this note is a record for all you recipe-copiers. If anyone's got really salty, oily granola, apologies! One of the things that's kind of tricky about cooking this month is that I can't use citrus juice, wine, or any vinegar not made locally of local ingredients. Local vinegars are available at some farmers' markets and specialty stores, but I haven't really put out the effort to find them. I'm making vinegar from apple cider, instead. But it's not ready yet, so, tracking down an acidic substance to throw into last night's salad dressing was a bit of a challenge. 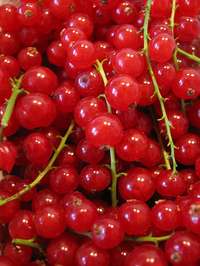 I found local currants grown in New Haven, VT at the store yesterday, and bought a carton each of red and black ones. Gahlord and I tasted some and they made our faces pucker, so they're our new stand-in for lemons. I made up this recipe on the fly when I needed salad dressing; I think it would work equally well with raspberries. Wash and string the currants, and mush them up with a fork. Stir in the maple syrup, and taste for sweetness. Add a bit more syrup if it tastes too tart, or more currants if it's too sweet. Stir in the olive oil, salt, pepper and herbs, and you're good to go. If the dressing seems a bit thick, you could thin it with water or apple cider, but be careful not to oversweeten it. I left the currant seeds and skins in there, but I suppose you could strain them out if you wanted a really smooth sauce. Put on the salad of your choice, and enjoy!